Map of the corner of Landrum Lane and Palm Valley. Hard to read, but if you zoom in you can see the entrances off of each road. For those who live off of Palm Valley Road/210 or who use the carline at Landrum Middle School or Ocean Palms Elementary, my guess is you are aware of the development being planned for the corner of Landrum Lane and Palm Valley Road. It’ll be right across from Daily’s, just before you get to the YMCA. 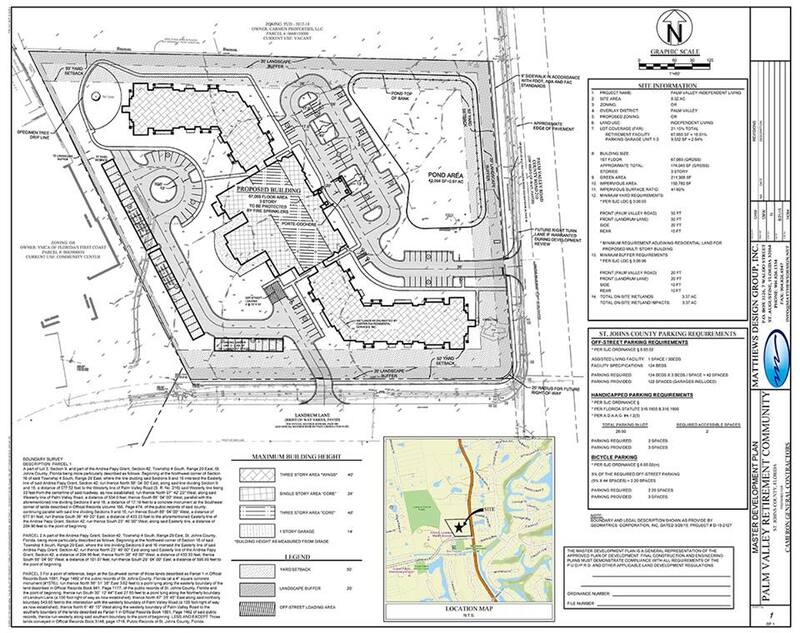 The development, known as Resort Lifestyles, is requesting a zoning variance to make the building 48 feet tall as opposed to the currently zoned height restriction of 35 feet for coastal areas. There is a meeting TODAY, November 19, with the Planning and Zoning Agency (PZA) at 1:30 at the St Augustine main auditorium to discuss the variance. The Palm Valley Community Association has taken a stance against the height variance, over concerns that it will change the overall feel and personality of Palm Valley. For details please read the letter below, and attend the meeting if you have an interest in the issue!! The Growth Management, Traffic and Roads Action Committee (GMTRAC) has been tracking a number of developments in the area for months. It is extremely important that you are aware of specific items that could cause noteworthy changes in our community. If a developer wishes to build a project, he must first apply for the necessary permits to the appropriate department(s) in St. John’s County. The county and our GMTRAC group works with the developer and at a some point the county schedules the proposed application to be heard by the Planning and Zoning Agency (PZA) and the Board of County Commissioners (BCC). The PZA hearing is set for a specific agenda in the future and developer first presents his proposed project to them. At the end of the hearing, a vote is cast by the PZA to approve or reject the developer’s application. Next, the BCC hearing is scheduled for a specific agenda and the developer then makes a presentation to the BCC. At the end of the hearing, a vote is cast by the BCC to approve or reject the developer’s application. The developer must get the approval of at least the BCC to move forward with his project but not the PZA, necessarily. However, the BCC does give considerable weight to the PZA decision. That being said, the Resort Lifestyle project at the intersection of Palm Valley Road and Landrum Lane will be presented to the PZA on Thursday, November 19, 2015 at 1:30 pm. It is the first item on the agenda and will be heard immediately. The BCC will have it on their agenda on Tuesday, December 15th (time to be determined) and will make the final decision as to approve or deny the request of the Resort Lifestyle developer. Your Palm Valley Community Association Board as well at the GMTRAC committee has taken a position and is requesting the PZA and BCC to deny the project as currently designed. Please see our comments to the PZA and the BCC attached. Our Board believes that this project and others like it can significantly change the way Palm Valley looks and feels in the future. Whether you are for the project or against it. We suggest that you attend both the PZA and BCC hearings. If you are there, you will have an opportunity to speak about your feelings for 3 minutes to the PZA and BCC boards. I will be at the PZA meeting on Thursday to speak—I will be in the front lobby of the County Auditorium at 1:00 pm on Thursday if you would like to discuss the project or have any questions prior to the PZA hearing.